IS YOUR HEALTH STATUS CHANGING? We’ll help you prepare for the unexpected. For years I heard the voice of a wise old sage (my mother) tell me, “If you have your health you have everything.“ It wasn’t until I hit the midcentury period of my own life that I truly appreciated that statement. So what do you do with this wisdom? “Plan for the best, but prepare for the worst.” Can you guess who made that statement? That’s right, my mom! According to cancer.org, in 2015 there were an estimated 500,000 cancer deaths in the United States alone. Alz.org estimates by 2050 the numbers of people age 65 and older who become afflicted with Alzheimer’s may nearly triple from 5 million to as many as 16 million. Heart disease is estimated to affect 611,105 U.S. citizens according to cdc.gov. These numbers aren’t meant to scare, they are written to jolt you into seeing the need to prepare for the worst. Having the funds available for care if these health issues become yours to deal with and is critical in keeping the quality of life as high as possible for you and your loved ones. We’re here to help. Watch the video, read the case study and call. Listen to an audio recording of how we helped someone plan for their changing health status. A long-term client of SVA Financial Group worked with trust and wealth management advisors throughout many major transitions in his life, including planning for the management of his affairs during disability and transferring his assets to his children after his passing. In their late 60s, a couple turned to SVA Financial Group to help manage their finances. The husband, a busy professional, was still working and wanted help managing the significant assets they had accumulated over the years. As the family’s lives changed in the next 15 years, SVA Financial Group worked closely with the family to keep their financial and estate plans in sync. SVA Financial Group restructured the family’s financial plan several times. First, as the couple neared retirement, they created a new plan based on the selling of the family home, moving into an easier-to-care-for condominium and consolidating their various 401(k) and IRA plans. A few years into retirement, the wife died unexpectedly. Several years later, the husband decided to travel more. With his advisors’ guidance, the client decided to move his assets into several trusts, naming SVA Financial Group as agent. This gave the client the freedom to leave home when he wanted, knowing that SVA Financial Group would handle routine financial duties such as paying bills, as well as continue to assist with regular wealth management tasks. SVA Financial Group overhauled the financial plan again as the client was diagnosed with Alzheimer’s disease. Before his condition became too severe, they worked with the client to create concrete financial and health plans of action. The client decided to step down as trustee and appoint SVA Plumb Trust Company in his stead, meaning that SVA Plumb Trust Company would take over all of his financial activities including investments, bill paying, coordination with legal advisors, preparation of income taxes and real estate transactions. In addition, the SVA Financial Group team worked with the client’s attorneys to make sure that the client’s adult children had Powers of Attorney for health and financial matters. As the client’s health condition worsened, the children were in constant contact with SVA Financial Group to make major decisions such as moving the client into a senior care facility and selling real estate. Finally, after the client passed away, SVA Financial Group worked with the family to transfer his assets to his beneficiaries. The client’s children continue to work with SVA Financial Group today. 70% of family conversations about aging are prompted by an event such as a health crisis or other emergency. Have you put together a plan in case this happens? 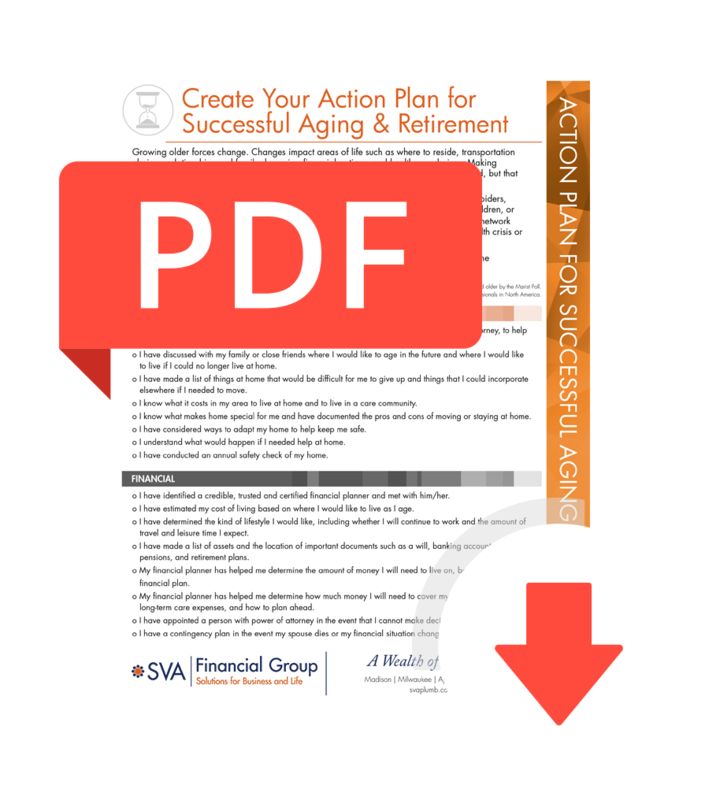 Create your action plan for successful aging and retirement.